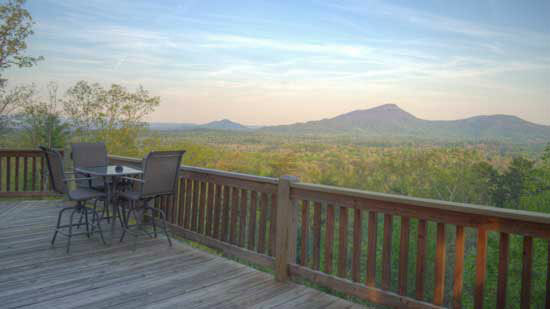 Lookout Pointe - Gorgeous Cabin Rental near Helen Georgia with THE best scenic mountain views... stunning! Luxurious mountain retreat outside Helen, GA. Enjoy the views from the large decks and hot tub. Relax and take in the fabulous mountain views from this gorgeous two-bedroom cabin rental near Helen, GA. From the NW side of Yonah Mountain, the views are spectacular, with some of the best mountain vistas in the Alpine Helen GA area! This luxurious mountain vacation cabin rental just outside Helen is the one place where location and incredible views come together for an unforgettable mountain experience! Full walls of sliding doors along the back of the cabin open up the living area and master bedroom to the outstanding views that await you on the private, secluded deck. Cozy up by the fireplace in living area and take in your favorite shows, or enjoy the game room on lower level. For pure relaxation, take a leisurely soak in the private hot tub on lower deck with the same beautiful views! There’s plenty of room for everyone to stretch out and settle in for a relaxing escape from the ordinary! Lookout Pointe is located on a mountain road - 4 wheel drive recommended during winter months, but is not required. • Gravel roads and driveway, luxury or low-lying vehicles not recommended, accommodates 2-3 vehicles. • Visit our Local Area Guide for more information. Lookout Pointe is approx 5 miles from Helen! Absolutely beautiful and amazing views. The customer service was great. I had an issue trying to book my cabin after hours. The very next day before I even had a chance to call the office they were calling me to help fix the problem and book my cabin! On my 2nd of my trip I had an issue with the fireplace but within 30 minutes in talking with the office we had it fixed. Our stay at the property was wonderful! We came up for my husband's birthday and we had just a great relaxing time staying at the cabin. We brought my mom along with us as well and she enjoyed sitting in front of the fire reading her book. We never left the cabin except to get food for the trip. My husband and I played pool and watched movies downstairs and relaxed in the hot tub at night. The views were amazing and I was so sad to leave, we also happened to catch the blood moon and it was breath taking to be able to see it with all the stars!!! We had an amazing stay! Cabin was clean and the view was gorgeous! When we contact the team they were very helpful and kind. They answered all our questions respectfully and helped us get to our destination. The cabin was a very relaxing place to stay, very comfortable and very well insulated (outside was 22 F).I had a great time playing pool with my daughter and wife.The fire place was one of our favorite features, and It was just impecable. We had all the necessary for a very comfortable stay. We planning a future summer vacation and definitely will contact Pinnacle to rent a cabin (hopefully the same one). We had a great time staying at Lookout Pointe. The view was amazing, the cabin and hot tub were both clean and very well kept. The loacation was seculuded yet close to town. 100% satisfied, we will visit this location again and again! Nice, relaxing, refreshing and enjoyable! Professional and friendly service very knowledgeable. I really enjoyed my stay and look forward to returning soon with my family again. All handled by web and e-mail. Awesome cabin, great view. Very relaxing. Working with the team at Pinnacle Cabin Rentals could not be easier. Everything was taken care of over the internet and emails. We did not have any problems and the entire experience was perfect!! The cabin was everything we expected and more!! The directions took us right to the cabin and the view was awesome!! My daughter loved playing pool and foozball in the game room and we enjoyed relaxing in the hottub. Overall this was a perfect mini-vacation!!! Thank you Pinnacle Cabin Rentals!!!!!! Most of our experience was on-line, but it was very smooth and easy. The property is beautiful. Home was comfortable and inviting. We found ourselves staying more in the cabin than planned because we enjoyed it so much! Jill was amazing...she was very helpful and quick to get back to me! Thanks Jill! Thank you for making our stay go so smooth! We will definitely be using your services in the future!!! They were great and always nice. Even during winter 2016. One of the best places we have ever been. Perfect is the best word to use. Thank you so much. It was a pleasure dealing with everyone. It was a great experience from beginning to end. The only comment that I have for the property managers is that the WiFi code is incorrect on the paperwork both in the cabin and the emailed documents. We were able to find the correct password on the back of the modem. That would be the only update that I could recommend. We had such a lovely time in your cabin rental. The views were spectacular and I think that's the best I have slept in a long time. We didn't feel like it was a vacation property rather our home away from home. Thank you so much for creating such an inviting place to be. We will certainly be back much sooner than we had planned for prior to being up there. This property fit our family of four perfectly. Beds were great and it was well decorated. The view from both porches was really awesome. Your team was great and helpful when I needed maintenance. We had a great time. Nights were quiet and relaxing. When we had difficulties with the wifi you helped with kindness! This was a beautiful cabin, perfect for a weekend away! The views were INCREDIBLE and were our favorite part! This cabin is located in the center of everything, grocery stores, winery, shopping and more! I'd love to stay again! Great stay.. It's our second time staying on the property. My family and I thoroughly enjoyed the stay. The view is amazing. Loved the hot tub. We will be back for a third go around.